← November Brooklyn Flea Dates – last of the outdoor season! Shop handmade with Melody’s Addiction for the holidays! 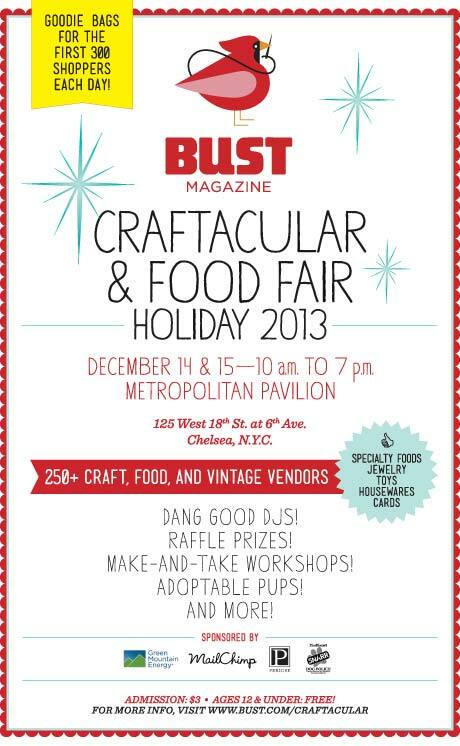 It’s time for the annual BUST Magazine Holiday Craftacular. Bring your shopping list and enjoy over 270 handmade, vintage, and fancy-food vendors and their amazing wares. Something for everyone! The Metropolitan Pavilion, located in the middle of NYC’s beautiful Chelsea neighborhood, is one of the most coveted event spaces in Manhattan. The airy, high-ceilinged Pavilion is steps from the 1, 2, 3, L, F, and M trains, as well as a multitude of restaurants, bars, and the historic High Line park. Admission is $3; kids 12 and under get in free. A coat and stroller check will be available. Put the fun back in holiday shopping!